The jury in the trial of Shoreham Airshow pilot Andrew Hill has been told to focus on "why things went so disastrously wrong". Summing up the trial, Judge Andrew Edis said "what happened is pretty clear" but "why it happened is really what the case is about". Mr Hill, 54, crashed an ex-military jet on to the A27 in Sussex on 22 August 2015, killing 11 men. He denies 11 counts of manslaughter by gross negligence. Prosecutors allege he committed to a doomed aerobatic loop while flying too low and too slow. Karim Khalil QC, defending, argued that Mr Hill's actions were "frankly inconceivable" unless he was "impaired". 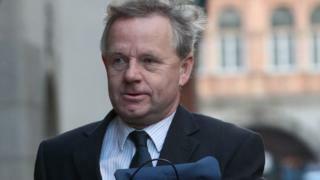 Judge Edis told the jury that it must decide if the prosecution had proved cognitive impairment had not affected Mr Hill during the flight. "You have heard a great deal of evidence from Mr Hill, onlookers and experts to explain what took place," he said. "It is for you to decide what of that evidence you find helpful and persuasive and what you find unconvincing."